At first, it feels like there’s a perfunctory quality to the opening scenes of Paul Greengrass’ harrowing true-life drama Captain Phillips. The titular commercial shipping-vessel captain, Rich Phillips (Tom Hanks), talks with his wife (Catherine Keener) on the way to the airport about the academic difficulties of their son—just typical, fairly banal spousal conversation. Given what we already know about the ordeal to come—that Phillips is heading to a job where his voyage from Oman to Mombassa will be hijacked by Somali pirates seeking ransom—it would be easy to wonder if Greengrass and screenwriter Billy Ray (Shattered Glass) are engaging in the kind of simplistic “sympathy-building” back story that often seems more obligatory than inspired. Maybe they’re only making sure we know that there’s a wife and family back home, just worried sick about Captain Phillips. I don’t think it falls under the realm of “spoilers” to note that Phillips’ wife literally never appears again—not even for waiting-anxiously-by-the-phone cutaway footage. Greengrass has a different sense of how to approach procedural thrillers, as he showed dealing with a hijacking of a different kind in United 93. He’s got a unique perspective on what makes a hero, built into the mundane normalcy-establishing prologues to his pulse-quickening movies; he knows how to convey ordinary people, thrust into unimaginable situations, forced to push past fear to do what they know they must. Captain Phillips covers only a few days in April 2009, yet it’s an ironic sort of compliment to say that the experience feels much longer. That’s because the circumstances keep shifting, beginning with the pirates first approaching Phillips’ Maersk Alabama vessel but being chased off by a combination of tactical maneuvers and flat-out trickery on Phillips’ part. Then, one group of the pirates—led by the determined Muse (Barkhad Abdi)—decides to try again, and successfully manages to board the ship and take Phillips hostage while other crew members hide in the engine room. And even when some of the crew’s improvisations prove successful, Phillips alone still has a longer ordeal to endure. Greengrass pulls us through these various reversals of fortune using his now-familiar shaky-cam style, emphasizing the moment-to-moment urgency of the situation. He builds tension simply and unobtrusively, focused on the idea that the survival of the Maersk Alabama crew depends largely on them doing exactly the things they’re trained to do in such emergencies. While Phillips often has to think on his feet to keep the rest of the men safe—attempting to divert the pirates’ attention from hiding places, or notifying crewmen that one of the pirates is barefoot so they can scatter broken glass—improvisation isn’t what provides most of the gripping interest in this story. From the actions of the Maersk crew through the preparations of the Navy SEALs brought in to facilitate a rescue, Captain Phillips finds suspense in the simple, businesslike execution of a game plan. There is, to be sure, a human element here as well, and not just in Hanks’ performance. He’s impressive in a way we haven’t seen him in a long time, capturing the sense of responsibility that drives Phillips’ methodical approach to a harrowing crisis; a late scene, in which the weight of what Phillips has gone through finally bubbles to the surface, may be the best single moment of Hanks’ acting career. Yet Greengrass also takes a risk, as he did in United 93, in making his ruthless hijackers flesh & blood men, driven by a sense that they have no other choice but to do what they do. Barkhad Abdi’s Muse becomes a unique kind of cinematic villain: cold-eyed and single-minded about the task at hand, while still human enough that he almost feels like a different kind of hostage to his circumstances. 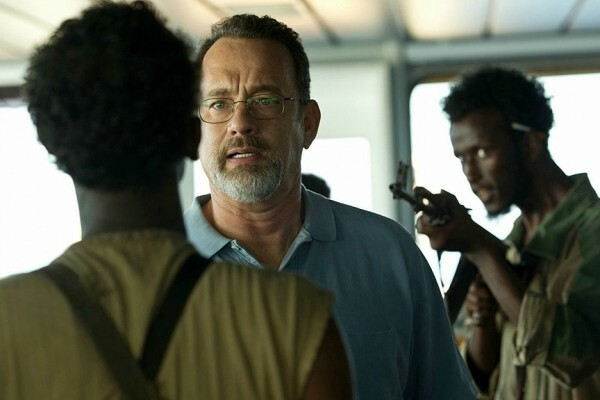 As the final half-hour of Captain Phillips begins to focus on the military operation to isolate and take down the pirates, there is a sense of anticlimax compared to the relentlessly unnerving events leading up to that point. The film also remains as efficient as the characters on which it focuses, never opting to divert focus to those worried family members on the homefront. Greengrass makes the drama of real-life people facing life & death choices into something stripped down to adrenaline and intelligence, finding the purest action in the simple will to survive.